I spent last night doing my taxes. I know—for those of you who take weeks to do you taxes and are in and out of accountants offices countless times between February and April, this might make you sick. But I'm single, own nothing of consequence and spent most of the year unemployed while I finished up school. I thought taxes this year would take about fifty seconds to say, "Hey, I made no money and dumped thousands of dollars into our failing economy because I paid out-of-pocket for school and my car died on me. 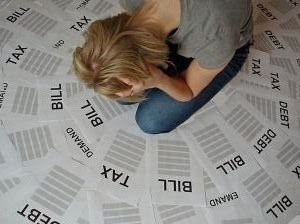 I deserve a full refund on all $750 I paid in taxes." I had to file taxes in two states, and I have decided the Virginia state tax form is the most insane document I have ever seen. It took me three hours to do all these calculations only to find out I could have skipped half of them and just applied for a full refund. There are 47 lines on the Virginia Part-Year Resident Income Tax Return form, and that doesn't include the 23 sub-lines, two columns and about 50 worksheets that all need to be filled out as well. And I believe to Utah State Tax Commission is just as insane. They (seriously now) put a little frowny face on the form on the line if you owe taxes and a little smiley face on the form if you should get a refund. Emoticons on tax forms? What is this world coming to? By the time I finished the two state forms, I was wishing I could just fill out the federal 1040EZ a hundred times over. Here's to not moving this year and only having to file in one state. Remember how just yesterday I was saying the weather was supposed to get better any day now? Well, I should have looked at the forecast a little more closely and realized it was going to get a lot worse before it started getting better. And don’t get me started on the snow-induced craziness of this morning’s commute. It took me an hour to go the four and a half miles to work this morning because people freak out when they see snow around here. 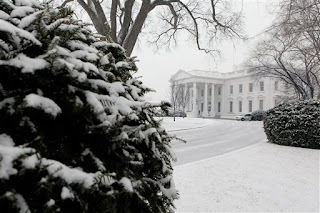 The calm blanket of white that now covers the DC area might look lovely and serene, but I know it is really a wizard’s spell designed to make people drive like lunatics. Maybe it’s a GOP conspiracy to put off the vote on the economic stimulus package. I guess I should give them a break—not everyone was born in Wisconsin, grew up in Chicago, went to school in Idaho and lived in Utah. I have a lot of snow-driving experience. I have to agree about your description of what the blanket of white really is. It doesn't matter that we get snow here every year and people should know how to drive on it--there's still accidents galore after a storm. It really does turn people into lunatics!